We offer Stainless Steel Adapter. Due to our honest business standards and transparent deals, we are steadily making our way to the platform of success by offering SS Adaptor. If the components within hydraulic systems never had to be removed, connections could be brazed or welded to maximize reliability. However, it is inevitable that connections must be broken to allow servicing or replacing components, so removable fittings are a necessity for all but the most specialized hydraulic systems. We are a most trusted name amongst the topmost companies in this business, instrumental in offering high quality array of SS Adaptor. 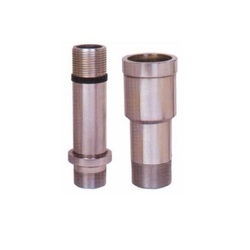 The High Grade SS Adapters are in high demand due to their excellent quality. Made using high-grade raw material, these are available at a reasonable rate. We manufacture & supply premium quality of Stainless Steel Adapter that conform to the prerequisite industrial standards. Available in several sizes and specifications, we ensure that our vast range of stainless steel adapters conforms to the required industrial quality, design & functionality standards. We are the Manufacturer & Exporter of FAV SS 316 Adapter 1" BSP F x 12 JIC M, 3000 PSI. Due to our honest business standards and transparent deals, we are steadily making our way to the platform of success by manufacturing SS Adapter.